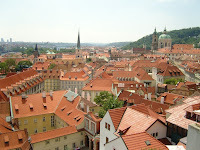 Our Wandering Family: Prague... it's not Africa! Oh, the irony of it all. When I first moved to Africa, I was disappointed that it wasn't more European. Where were the beautiful old castles and charming cafés? But of course, now that we're back in Europe, I long for the aloe plants, lagoons, and mountains, of the place that we recently called home. On our 4 hour drive from Germany to the Czech Republic Friday evening, the castles and green rolling hills bored me, rather than exciting me. 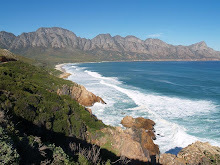 It made me long for South Africa. And yet, I realize that we're lucky to be here, that it's far safer, and that I should be enjoying every minute. 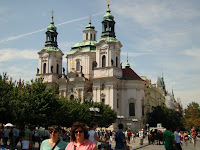 We did enjoy Prague, although it was a bit of a rushed trip. On Saturday, we explored the city, walking to the castle and over the famous Charles Bridge, before meandering through the narrow, cobblestone streets and past the clock tower and café lined city squares. 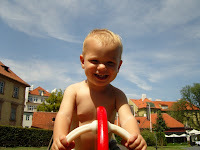 We also managed to find a couple playgrounds for Lukas to play on, and a park, allowing us to escape the massive crowds of tourists. For dinner, we met our friends, Miro and Viera, and their children, Laura & Gregor, dining at a little café that we found, which was just around the corner from our hotel. The next morning we also met for breakfast, then we packed up and headed back to Germany, stopping in the city of Pilzen for lunch on the way. After having dinner at Tobi's parent's place last night, we're on our way back out again. This morning we leave for The Netherlands, where we'll spend a few days in our new "home" - Vlissingen. I hope to be able to find us a house while we're there. For now, it's time to pack up (again!). Wish us luck!